The Royal Air Force ( RAF ) is the oldest independent air force in the world. It was created on 1st April 1918 as a result of the merger of the Royal Flying Corps ( RFC ), the air arm of the British Army, with the Royal Naval Air Service ( RNAS ). In the hundred years since, the RAF has carried out numerous missions throughout the two World Wars and the Cold War that followed, all the way to the modern day conflicts in Iraq and Afghanistan. It plays a critical role in upholding the national interest of the British people and protecting the sovereignty of the United Kingdom. The RAF is synonymous with innovation and technological advancement and is the envy of many other air forces of the world. 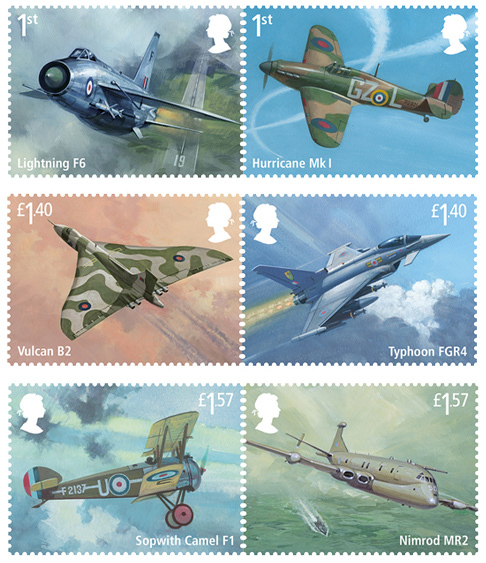 The Royal Mail celebrates the centenary of the RAF by releasing a set of stamps and a miniature on 20th March 2018 depicting various combat aircrafts flown by the RAF past and present. The RAF has had too many unique and iconic aircrafts in its hundred year history. 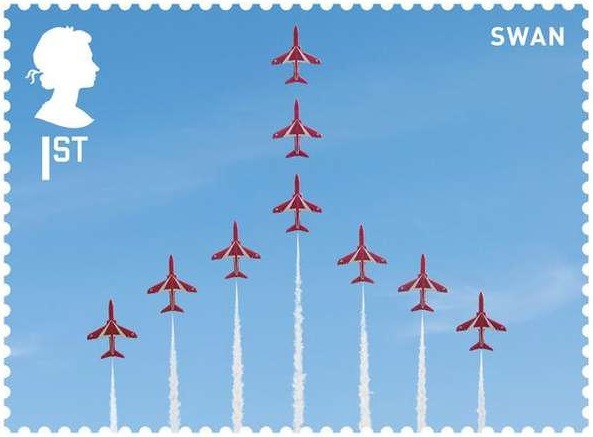 Not all can be included in a stamp issue featuring six different designs. The most glaring omission in this series is the Hawker Siddeley Harrier, the world's first operational combat aircraft with vertical take-off and landing capabilities. Also missing are the Gloster Meteor, the first British jet fighter, the Avro Lancaster bomber of the Dambusters fame, the Panavia Tornado, the only British fighter with variable sweep-wing and the de Havilland Mosquito which has a frame constructed almost entirely of wood. Of course the forward looking might wish to include the latest or even future aircraft types such as the Lockheed Martin F-35 Lightning II as well as the Boeing P-8A Poseidon. 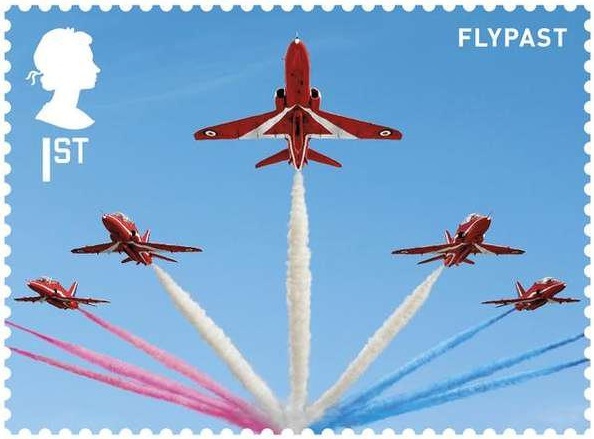 Let's have a closer look at the six chosen by the Royal Mail. 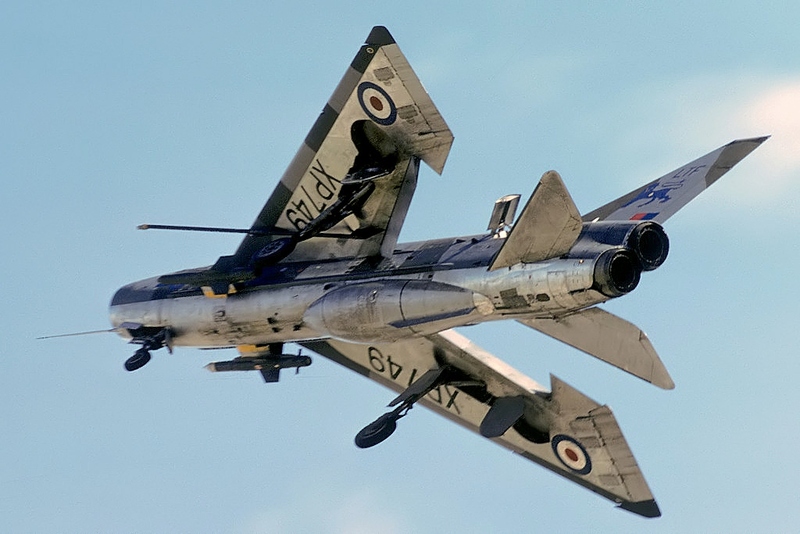 The BAC Lightning F6 with the de Havilland Firestreak air-to-air missile. 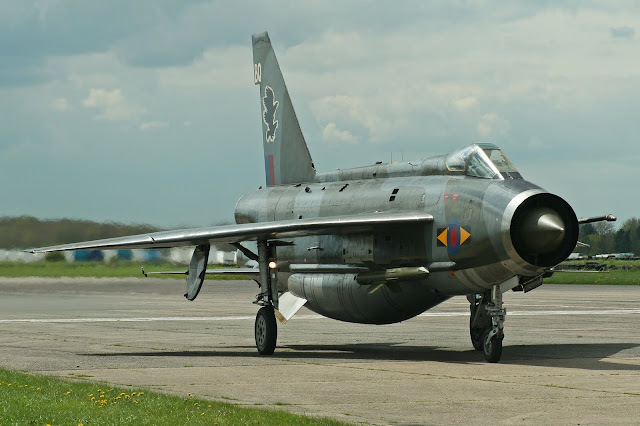 The English Electric ( later British Aircraft Corporation ) Lightning was initially designed and developed as an interceptor to defend the V bomber airfields from nuclear-armed supersonic Soviet bombers. As such, the Lightning had an exceptional rate of climb, ceiling and speed. Unfortunately that high performance came at the cost of high fuel consumption which translated to a very short operational range. The addition of non-jettisonable ventral fuel tanks eventually helped to increase the combat endurance of the Lightning fighter. Physically the Lightning seemed to lack the aero-dynamic elegance seen in fighters of the same era like the A-4 Skyhawk or the F-4 Phantom II. It has a nose-inlet cone that reminded me of the MiG-21. In what might be the most unusual design, its two turbojet engines were vertically stacked in a bid to reduce drag and to minimize the frontal area. 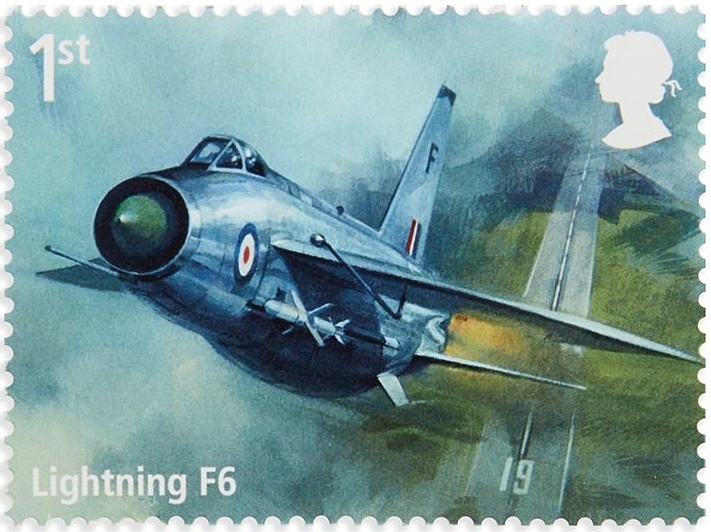 The Lightning F.3 and later variants also had the distinction of being the only all-British fighter that could attain speeds of Mach 2.0 or twice the speed of sound. It served in the RAF from 1959 to 1988. In 2008, the Lightning was conferred the Engineering Heritage Award by the Institute of Mechanical Engineers. The Hawker Hurricane was a single-seat fighter designed in the mid-1930s. 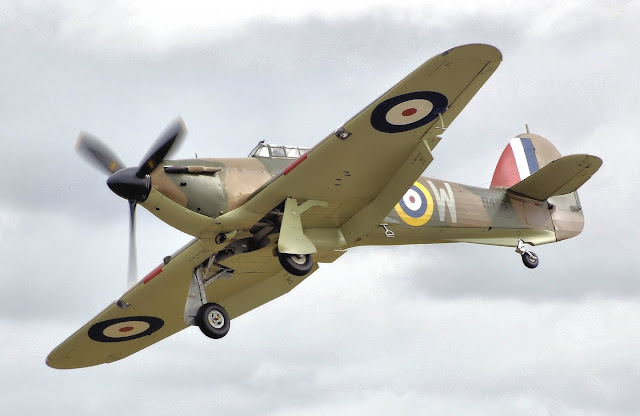 It entered service with the RAF in 1937 and was made famous during the Battle of Britain in the summer of 1940. Though inferior in speed compared with its main rival the Messerschmitt Bf-109, it could out-turn the German fighter especially at low altitudes and could well destroy it with its eight Browning machine guns. Together with the more advanced Supermarine Spitfire, the Hurricane Mk1 was renowned for defending the British Isles against the Luftwaffe, accounting for about 55% of the losses sustained by the German Air Force. Later variants would go on to fight in almost every theatre during World War II, from Singapore to North Africa and even the Soviet Union. 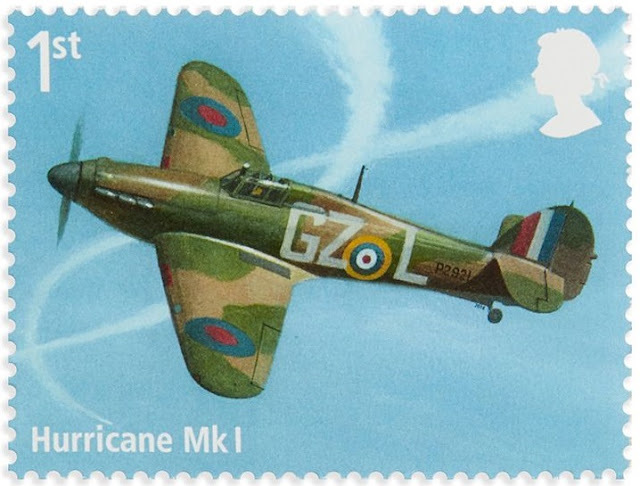 Production ceased in 1944 by which time a total of more than 14500 Hurricanes of all variants had been produced. The Avro ( later Hawker Siddeley ) Vulcan is a jet-powered, delta wing, nuclear capable high altitude strategic bomber of the Cold War era. The B.1 variant first entered service in the RAF in 1956 while the improved B.2 version depicted above was introduced in 1960. 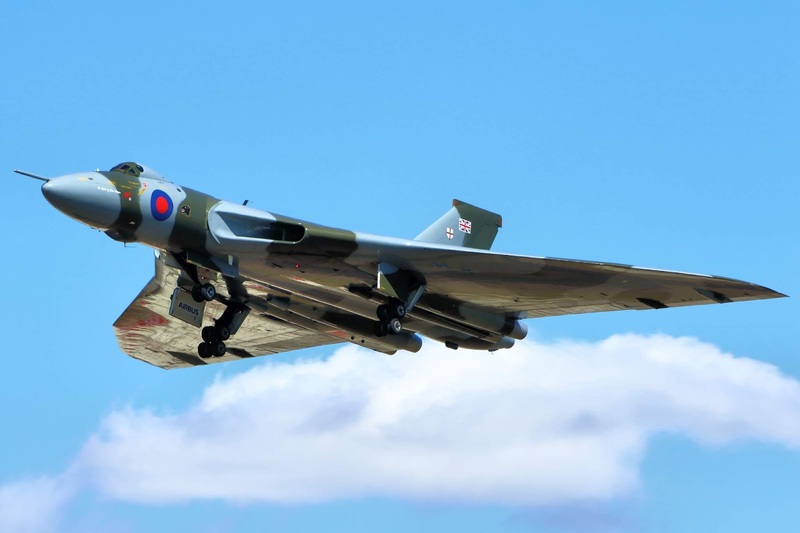 Together with the Vickers Valiant and the Handley Page Victor, the Avro Vulcan formed the backbone of RAF's Bomber Command in the fifties and sixties and are collectively known as the V Bombers. The strategic bomber fleet used to be an important pillar of the British nuclear deterrence policy against Soviet aggression until the development of surface-to-air missiles like the SA-2 rendered their survivability questionable. 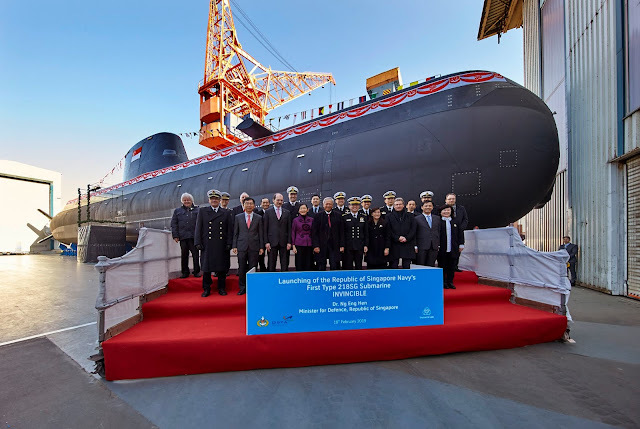 The burden of nuclear deterrence eventually shifted to the Royal Navy after 1969 with its Resolution-class nuclear ballistic missile submarines armed with the Polaris SLBM. 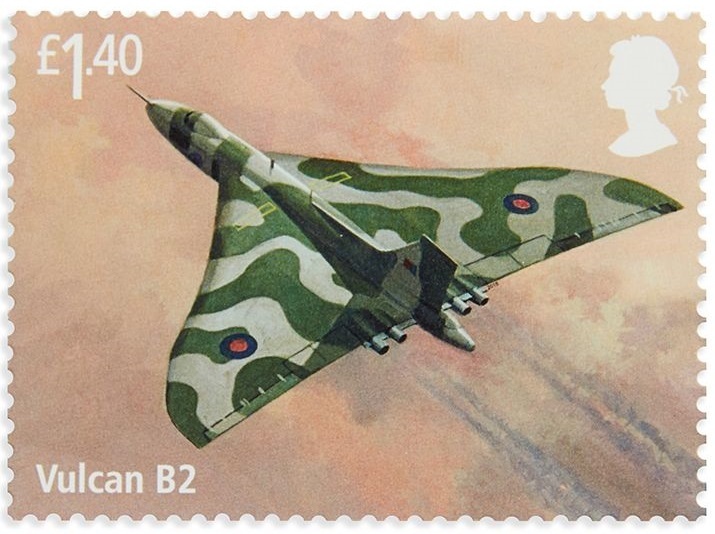 Apart from delivering nuclear weapons, the Vulcan was also capable of carrying up to twenty one 1000 lb. conventional munitions in its bomb bay. The Vulcan's only combat missions took place during the Falklands War in 1982 when it was tasked to carry out bombing raids on Port Stanley. Flying out of Ascension Island, it was a 6259km round trip that necessitated multiple inflight refueling of not only the main strike force but also the aerial tankers themselves. The damage done to the runway at Port Stanley was modest but the raids had a huge psychological impact on the invading Argentine forces. The Vulcan bomber was retired from service in 1984, just 2 years after the conclusion of the Falklands Conflict. The development of the Eurofighter Typhoon began in 1983 with a consortium of aerospace companies from several European countries. The long drawn and complicated process suffered many delays and setbacks which included the departure of the French to pursue their own future fighter program and shrinking military spending when the Cold War came to an end in the early nineties. Nonetheless, the first Typhoons were operational in the RAF by 2003. 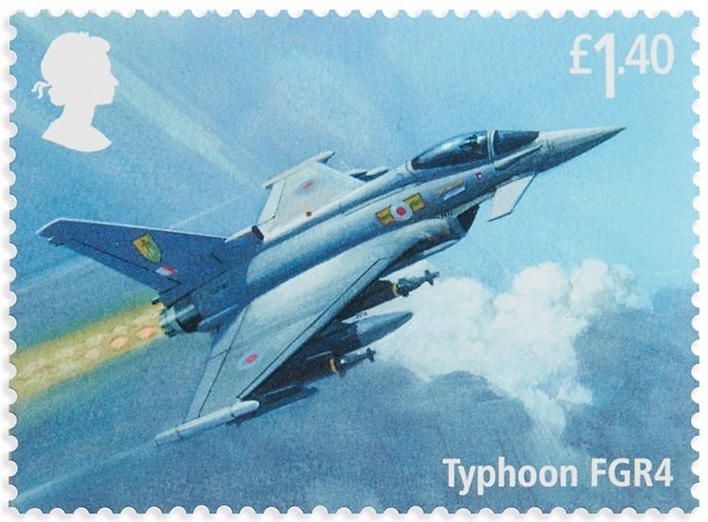 Initially in service as the F2 air defense variant, the Typhoon had been upgraded with respectable air-to-ground capabilities which included the compatibility with GPS / Laser guided Enhanced Paveway II and Paveway IV precision munitions when used with the Litening III targeting pod. These evolved Tranche 1 Typhoons are known as the FGR4. They will eventually replace the Tornado GR4 in carrying out ground attack and close air support roles when the latter is withdrawn from service in 2019. 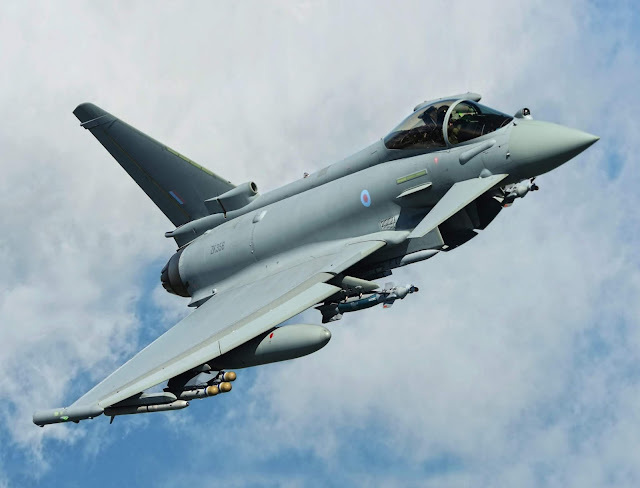 Continuous upgrades to the Typhoon will enable integration with new weapon systems like the Storm Shadow cruise missile, the Meteor air-to-air missile and the Brimstone air-to-ground missile in the near future. Further improvements could add maritime interdiction capabilities with the Harpoon or RBS-15 anti-ship missiles creating a truly multi-role combat aircraft. Eurofighter with Phase 3 Enhancement : ASRAAM, Brimstone, Paveway IV and Meteor. 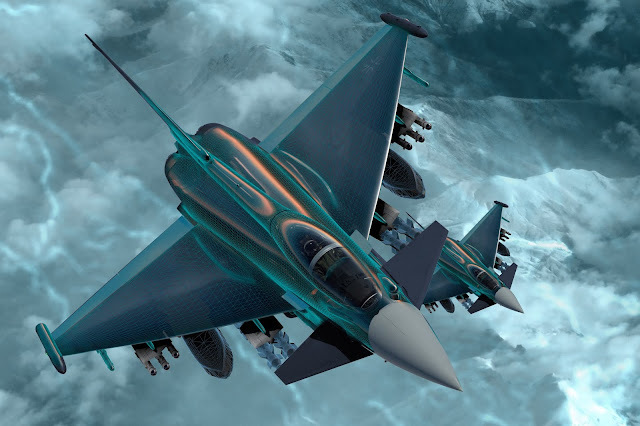 The future Eurofighter with Storm Shadow cruise missiles. 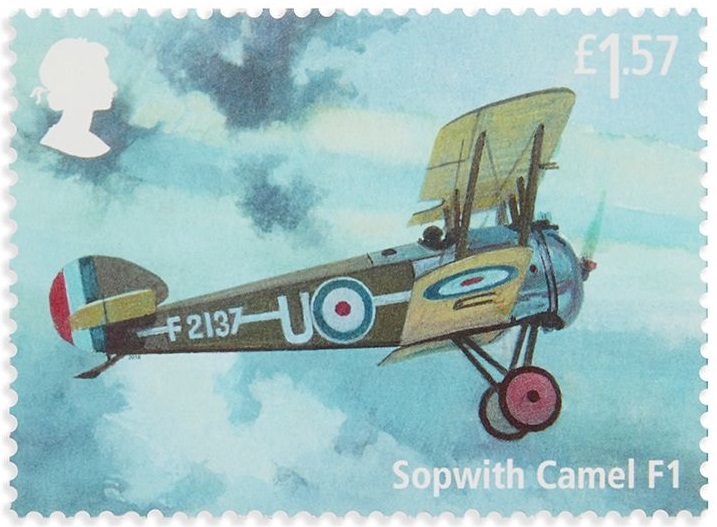 The Sopwith Camel was a British World War I single seat biplane fighter aircraft that was in service with the RFC and the RNAS in 1917 before their merger to form the RAF. 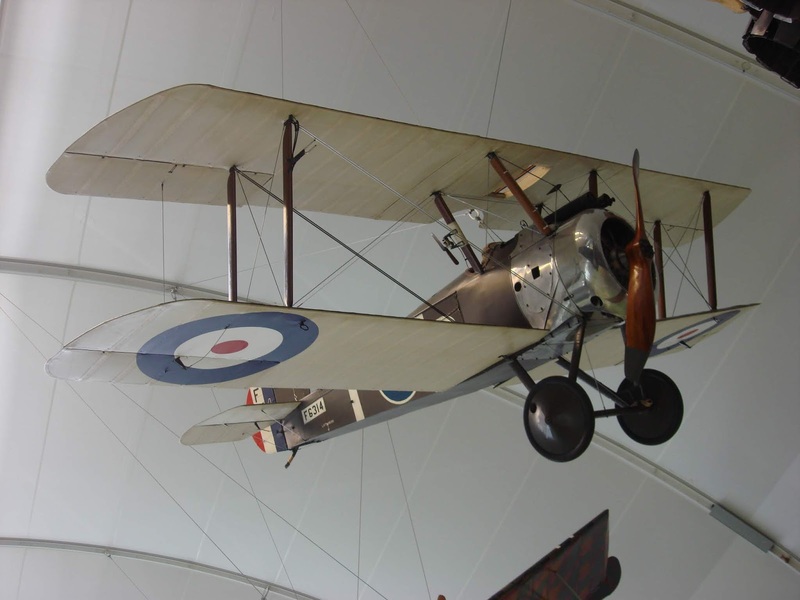 Manufactured by the Sopwith Aviation Company, it was powered by a rotary engine and was armed with twin synchronized .303 in Vickers machine guns. Although difficult to handle, the Camel was highly maneuverable in the hands of experienced pilots which was an important attribute in dogfights. By the end of the Great War, Camel pilots have been accredited for destroying 1294 enemy planes, more than any other allied fighter types in WWI. A total of 5490 Camel were produced with the main variant being the F1. It was retired from active service in 1920. 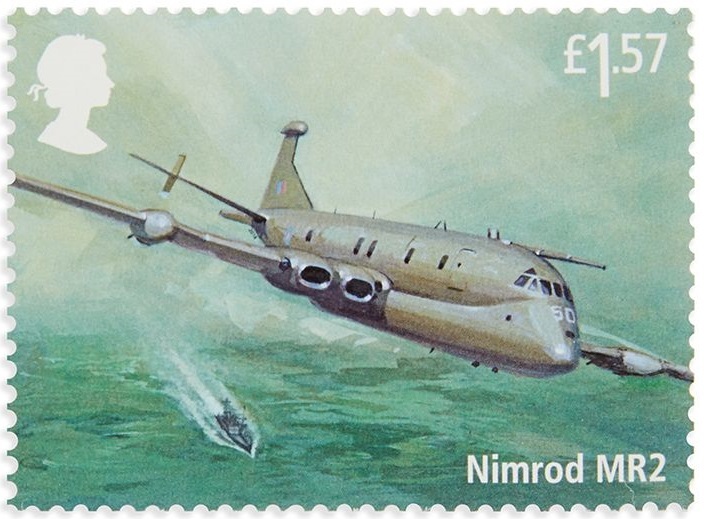 The de Havilland ( later Hawker Siddeley ) Nimrod was a jet powered maritime patrol aircraft that started service in the RAF in 1969. It was primarily a fixed-wing long endurance anti-submarine platform that had secondary roles in maritime surveillance and search and rescue. The Nimrod was derived from the de Havilland Comet, the world's first jet airliner, albeit with extensive modifications. The initial variant was the MR1 with the MR2 being a subsequent upgraded version. 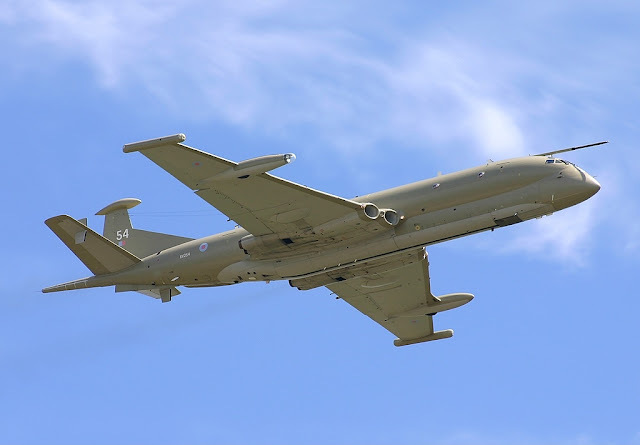 There were plans to replace the Nimrod MR2 with an extensively rebuild MRA4 variant by the year 2003 but cost overruns and protracted delays resulted in the project being axed after the UK's Strategic Defense and Security Review of 2010. The MR2 fleet was retired in the following year without any immediate replacement. This created an undesirable capability gap which will last until the delivery of its eventual successor, the Boeing P-8A Poseidon, currently scheduled for November 2019. 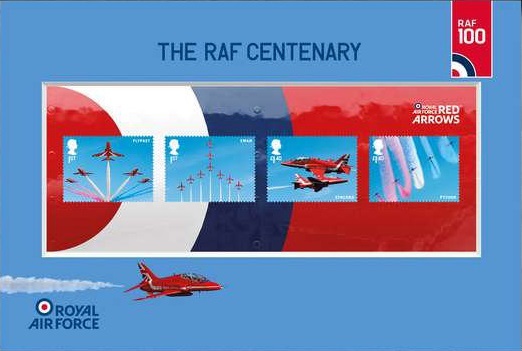 Depicted in the miniature sheet commemorating RAF 100, the Red Arrows, officially known as the Royal Air Force Aerobatics Team, is the RAF's designated aerobatics display fleet based at RAF Scampton in Lincolnshire. It was formed in 1964 with seven Folland Gnat T.1 jet trainers but made the switch to the BAe Hawk T.1 advanced jet trainer in 1979. According to the RAF, the Red Arrows have flown close to 4900 displays in 57 countries, by the beginning of 2018, the squadron's 54th season. 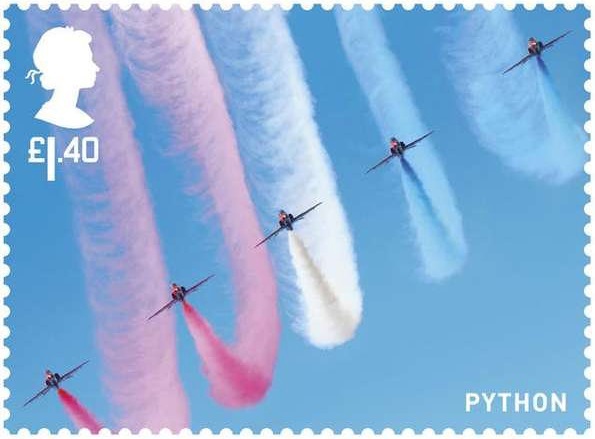 It also had this to say : " Representing the speed, agility and precision of the Royal Air Force, the team is the public face of the service. They assist in recruiting to the Armed Forces, act as ambassadors for the United Kingdom at home and overseas and promote the best of British. ". It looks like the Red Arrows will endure for many more seasons to come. 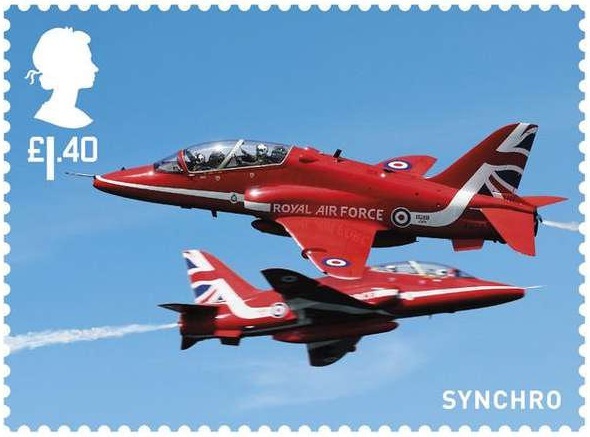 Readers who are keen to buy these philatelic commemoratives can purchase them at face value from the online shops of the Royal Mail or the Post Office Shop. The complete set of 6 special stamps cost GBP7.28 while the miniature sheet sells for GBP4.14. They will be available for a limited time only, usually one year from the date of issue, after which they will be withdrawn from general sales. So get them before they are gone!